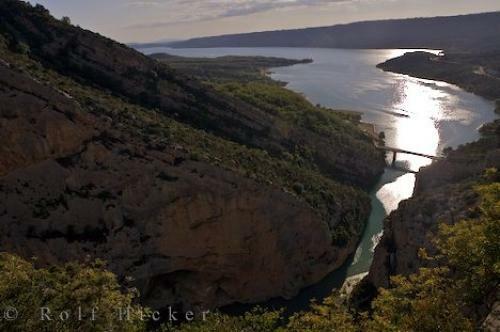 The Verdon River flows into Lac de Ste Croix from the Grand Canyon du Verdon in south-eastern France. The Verdon River is approximately 175 kilometers long and passes through several man-made lakes throughout one of Europe's most stunning river canyons known as the Verdon Gorge. This scenic gorge was created by the Verdon River in south-eastern France and is more than 300 metres deep. The name of the Verdon River originated because of the remarkable colors of the turquoise-green water that flows through this outstanding river canyon. The Verdon River is in the vicinity of the French Riviera which has made the river and gorge a major tourist attraction. There are many activities to enjoy throughout this beautiful countryside like rock climbing, hiking, rafting, kayaking, sailing, fishing, horseback riding or just take a simple stroll to enjoy some of the amazing scenery. Grand Canyon du Verdon, Gorges du Verdon, Parc Naturel Regional du Verdon, Alpes de Haute, Provence, France, Europe. Photo of the Verdon River in south-eastern France that flows through the river canyon known as the Grand Canyon du Verdon.